Looking for delicious ideas for cooking salmon? Here are 5 tasty recipes for salmon for you to fire up. These salmon recipes are fairly simple, quick and easy. We think that you'll absolutely love them. How simple do you think these are? Well, two or three of the recipes only call for 5 ingredients or less. Perfect if you're balling on a budget. I'm certain that you should feel like a gourmet chef in the domain of your kitchen once your company tries what you have whipped up and starts throwing compliments your way. Spread the cream cheese evenly over each cracker. 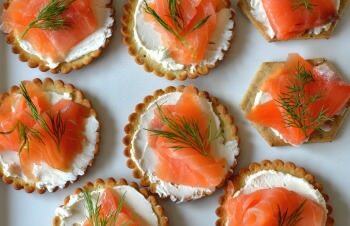 Place the lox on top of the cream cheese spread and garnish with dill. Alternatively, you can roll them up. In small bowl, combine the cream cheese, dill, and pepper. Spread evenly over each slice of salmon. Roll up each slice, like a fruit roll up. Cover and chill for an hour or so. Cut salmon rolls crosswise into about 3/4 inch pieces, like sushi rolls. Serve with or on top of the crackers. 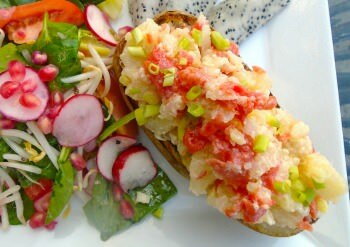 Wash potatoes and drizzle with vegetable oil. Bake at 450° until tender. Slice potatoes in half lengthwise. Scoop out inside of potatoes leaving a thin shell. Discard 4 of the shells. Add all ingredients with potato pulp and mash together. Fill the 8 potato halves with the mixture and sprinkle with paprika. 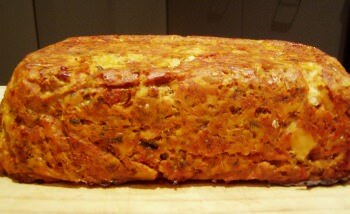 Bake at 350° for 20 minutes. Broil the last couple of minutes or until golden brown. Preheat oven to 350°. In large bowl, combine all ingredients except the lemon. Form into a loaf on a greased baking sheet. Bake 35-45 minutes, until top of loaf is lightly browned. Serve warm or cooled. Slice and serve with lemon wedges. Preheat your broiler to it's highest setting. Melt the butter and add the juice of one lemon. Sprinkle salmon with salt and pepper. 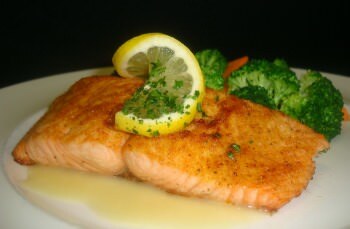 Place the salmon in a baking dish and brush with the butter. Broil for 5 minutes close to the heat source. Then, move it further away from the heat and continue cooking for another 3-4 minutes. Turn the fish over and cook until the skin is brown and the flesh is tender and moist. Serve basted with the cooking juices and garnish with the lemon quarters or slices. 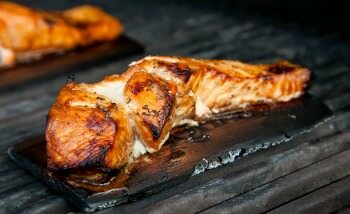 I had a wonderful piece of fresh caught salmon which I wanted to grill over hot coals. And I wanted to experiment with plank grilling. So I got some hickory planks from a local store. I soaked one of the planks in some mango juice for several hours to get it nice and saturated with the juice. Then I rubbed my piece of salmon with some olive oil and lightly salted it and added some white pepper and placed it on the plank. I put the whole thing over a really hot bed of coals, cooked it for about 10 minutes and, I swear, it was the best piece of cooked salmon I have ever had. You could probably do this with any kind of fish. Enjoy! Thank You to all who have contributed to this website. Be sure to check out and try the latest salmon recipes, one of the most recent sent in by Meg Colby above. Sounds delicious! Happy cooking fish and good luck freshwater fishing!